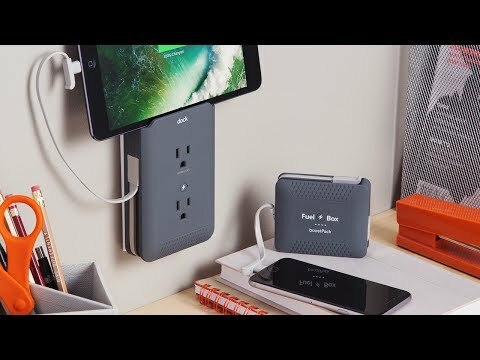 Turn any standard outlet into a full-fledged power station with two three-pronged plugs, a USB charging port and attached micro-USB and Apple cables. You can charge up to five devices at once while also powering a removable battery pack that can power two devices of its own. Dimensions: 8.4” x 3.4" x 1.2"
My Fuel Pack arrived just prior to my trip to Hawaii and am I grateful! My last power packs that I purchased from a different source doesn't charge as quickly or last as long! So I can tell you it is wonderful. 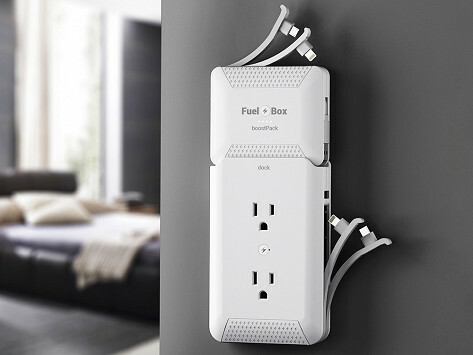 The onlu problem I encounter was the little piece on that back that you can permanently affix to your home wall doesn't always allow the main pack to plug in flush with the walls when traveling. I can say, however, that didn't stop the unit for fully charging and that is done quickly as well! The fuel box performs as advertised, charging for separate items quickly and efficiently wo overheating. It's rather compact size make it perfect for travel.